I hope you enjoyed Valentine’s day yesterday. I found myself with a bit of a cold and my other half across the Atlantic in Canada. This called for lots of tea and a late-night bake to cheer me up. In an attempt to bring my valentine a little closer to me, I settled on maple syrup cookies – a little bit of Canada in the heart of London. I am so happy with the way they turned out and the flat still smells of sweet, syrupy caramel. Using maple syrup and dark brown soft sugar give the dough a lovely rich golden colour. Here’s to staying cosy with loved ones and keeping winter at bay. I have kept this recipe very simple but feel free to be creative and add chopped walnuts or pecans for added texture. As you can see from the photos, I also used heart-shaped cookie cutters but other more intricate shapes would also work well as this dough hardly spreads during baking. Cream the sugar and butter until fluffy. I used a food processor but a wooden spoon and some elbow grease would work just as well! Beat in the egg, ensuring it is fully incorporated (scrape down the sides of the bowl with a spatula if you’re using a food processor). Then add the maple syrup and vanilla extract and mix well. In a separate bowl, sieve together the flour, baking powder and salt and fold into the wet mixture, half at a time. Wrap the dough in clingfilm and chill in the fridge for at least a couple of hours. Tip: I made my first batch after only half an hour of chilling (I couldn’t wait to try them) and then left the rest of the dough to chill overnight – cutting the cookies out in the morning from the properly chilled dough was so much easier and required a lot less flour. This is a very soft dough so try not to be impatient like me! Roll out the dough onto a floured surface and cut into shapes, 3-4mm thick. Place on a greased baking tray (you needn’t leave much space between them as this dough doesn’t spread very much) and bake for 9-10 minutes. The baking time will depend in part on your oven, how big your cookies are and how squidgy you like them. I wanted mine nice and chewy so I took them out as soon as they started turning golden around the edges. Cool on a wire rack and store in an airtight container…Or enjoy straight from the oven with a cup of tea! 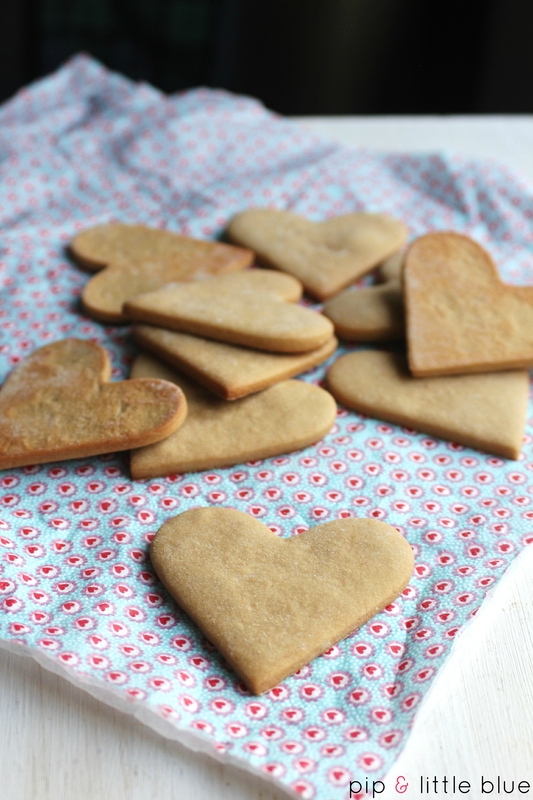 Tags: Baking, biscuits, cookies, easy, maple syrup, recipe, valentine's day, vegetarian. Bookmark the permalink. Previous post ← Happy pancake day! Love these ingredients! Do you know US conversions on this?